Zapier is a powerful tool to connect Drift to all different kinds of Marketing and Sales workflows that already exist within your organization! While getting started with Zapier can be intimidating, we've created this doc to help walk you through a glossary of common terms and address some frequently asked questions about how to use Zapier. A Trigger is the event that starts a Zap. For example, conversation closed is a trigger that you can use! New lead is a trigger that should be used anytime we capture email. If you are trying to drive an action off of email use this trigger. New Contact is a trigger that is used when we actually have a contact record in Drift and can be used to pull back contact attributes if you use the search function. End User ID —> A known user is added into Drift via an Integration sync or email picked up within a conversation. This search function exists for “User reaches goals” triggers, but can be used with the "New Contact" trigger as well. Anonymous ID —> We perceive this ID as a Lead ID, when someone chats in, not from a Playbook but just from the widget, and we don't have info on them, we just assign them an anonymous ID. This search function exists mostly to be used for Conversation closed trigger. Why we need searches: Triggers spit out these user IDs but in order to trigger an action, we need to accept an external ID. So we need to match it with the ID we give to a person to the ID you give them, in order to provoke that action from Zapier. 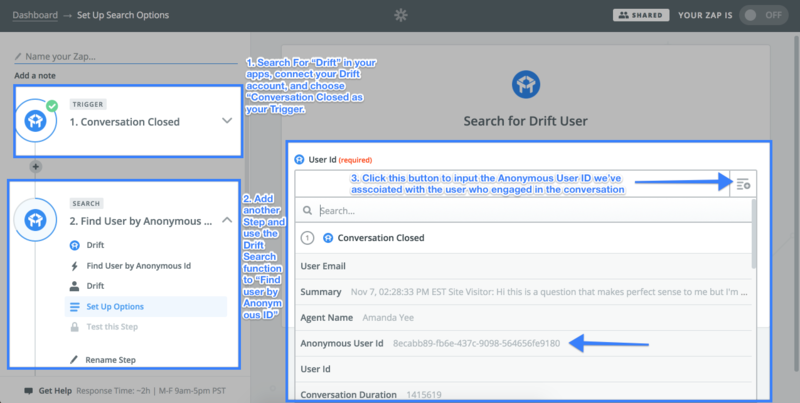 A common question we hear when we bring up our Zapier integration is: “Can we use this to map attributes to another application at the close of a conversation in Drift?" The answer to that is: Yes! Absolutely! To set this up you would use the "Conversation Closed" Trigger, Search for Anonymous ID, and then Add the action to create or update a Contact in your preferred CRM. Again, the answer here is yes! You will want to use the trigger User Reached Goal with Lead Stage, search end user id, and add the action in CRM update/add contact with those attributes. Setting up this Zap is very similar to the above example, however you will have to clarify which you want to use that will Trigger the Zap, and search by End User ID. We have a more detailed help doc on this Zap . We suggest using Zapier to connect Drift and your preferred CRM if we do not integrate with them directly. There is a limiting factor to using Zapier in this way, which is that no conversation transcript can be pushed into any CRM through a Zap. If you want to push over conversation events for a contact, the best trigger to use would be the "Conversation Closed" trigger.